The Canadian newspapers’ discourse on the use of Tasers changed after Robert Dziekanski died after the device was deployed against him, write Nicole Neverson, of Ryerson University, and Charles T. Adeyanju, of University of Prince Edward Island. The authors analysed 150 news articles (of a total of 304 discovered articles), published on the topic between 1998 and 2008. Robert Dziekanski was a Polish immigrant who arrived to Canada on 14.10.2007. After disembarking from the airplane, Dziekanski got lost and frustrated in the air terminal. The Royal Canadian Mounted Police confronted the agitated man, and used a Taser -a supposedly non-lethal device which fires electricity conducting wires into the target- on him. Dziekanski died on the scene, which was caught on video by a bystander and spread over the internet. Dziekanski was not the first nor the last person to die of Taser use in Canada, the authors point out. Yet it was his markedly public death that changed the way Canadian papers wrote about Tasers and their use. The “post-Dziekanski” coverage was more nuanced and more mindful of the controversial nature of the devices. For example, the occurrence of a discourse which depicts Tasers as “safe/non-lethal” plummeted to less than half of what it used to be. Conversely, the discourses “Taser as dangerous” and “Taser as controversial” became more common. The article “Worth a Thousand Words” was published by the journal Journalism Studies. It is available online (abstract free). 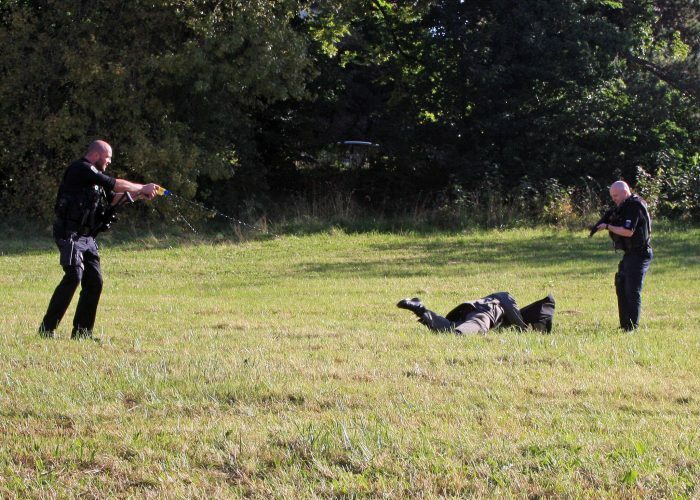 Picture: North Wales Police – Taser Demonstration by Gerald Davison, licence CC BY-NC 2.0.